Multiple outlets are reporting that Trenton Thunder infielder Matt Cusick — along with pitcher Andy Shive — have been dealt to the Cleveland Indians to complete the deal that netted the Yankees reliever Kerry Wood. Originally acquired by the Yankees midway through the 2008 season in the LaTroy Hawkins deal, the 24-year-old middle infielder has spent parts of the last two seasons in Trenton. Last season, he split time between High-A Tampa and Trenton, hitting .240 with no home runs and nine RBI in 28 games at the latter stop. 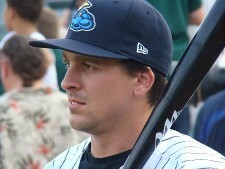 This year, he started the season in Triple-A Scranton before being sent down to Trenton for the remainder of the year. In 59 games at Double-A, he hit .234 with three home runs and 26 RBI. His season ended precisely when the Thunder year did, as it was his strikeout at the hands of Daniel Moskos that set off a raucous on-field celebration by the Altoona Curve in Game 4 of the Eastern League Championship Series. 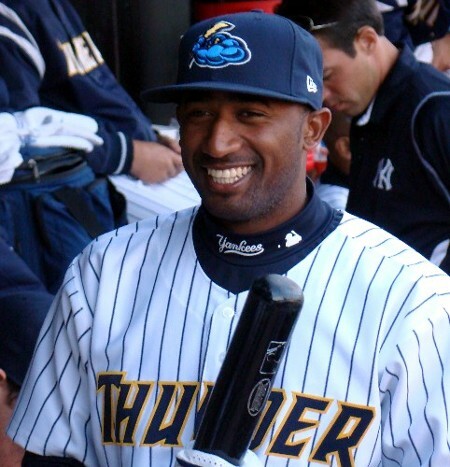 Eduardo Nunez was all smiles in the Yankees clubhouse last night, one season removed from a breakout year in Trenton. Following the Yankees 7-2 win in Game 5 of the ALCS last night, reporters surrounded all the usual suspects in the Yankees clubhouse. Reporters and camera crews were five deep at Derek Jeter’s locker within a minute of the doors being opened, while groups slowly crowded around Nick Swisher and others. Getting dressed by himself in the corner of the clubhouse, however, was Eduardo Nunez. Nunez spent his entire 2009 season in Trenton, putting together the best offensive season of his career. He established career highs in batting average (.322) and home runs (9) and drove in 55 runs while stealing 19 bases. Despite leading the Eastern League with 33 errors, Nunez’s offensive prowess did a lot for his progress in the organization, and earned him a 40-man roster spot going into this season. Having played most of this season at Triple-A Scranton, Nunez was used sparingly at the big league level during the regular season, but finds himself in uniform during the postseason thanks to an unfortunate season-ending injury to Yankees first baseman Mark Teixeira. Nunez said he was “practicing everything” down in Tampa and staying in shape in case somebody got hurt. While he was sad to see his teammate get injured, he was happy for the opportunity to experience the playoffs at the big league level. “It’s different, so different,” he said. Cliff Lee, who had a blink and you missed it stint in the Eastern League with the Harrisburg Senators and Akron Aeros, turned in a postseason pitching performance for the ages last night. When a reporter asked Texas Rangers legend and co-owner Nolan Ryan if Lee’s 13 strikeout performance in Game 3 of the ALCS was why, the Hall of Famer had a quick reply. “That pretty well sums it up,” Ryan quipped. Lee spent about half of his 2002 season in the Eastern League, playing for the Senators for 2 1/2 months and — following a regrettable trade by the Expos — about two weeks for Akron. Now 32 years old, Lee made one appearance at Waterfront Park, receiving a no-decision on May 15, 2002. He allowed three runs on two home runs, five hits and a walk. He also struck out seven. It’s safe to say he’s made great strides since facing the Thunder that day, establishing himself as one of the premier pitchers in postseason history. Ryan was certainly no pushover himself, and I asked the baseball icon what Lee did last night that made him so successful. “Just his control, he used both sides of the plate,” Ryan said. Lee is far from “home-grown talent” for the Rangers, as this marks his fourth different organization in the past two seasons. However, core Texas players like Ian Kinsler and C.J. Wilson have played a big role in the Rangers recent postseason success, and I asked Ryan how big of a key that’s been to his team’s playoff run. “Well, I think the team this year has found more ways to win than just being home run hitters,” he said. I’m here. Credential and everything. I’ll try to post as many updates as I can, but as far as the blog goes…the big boys can do a much better job of filling you in than I can considering they’ve seen this team all year. But check after games for any relevant info…and of course, check out my coverage in the Democrat. Contrary to what you’ve read, this was not Phil Hughes first playoff start. Well, sort of. It was his first big league playoff start, but his first professional postseason start came in a Trenton Thunder uniform on September 6, 2006 at Waterfront Park. It was Game 1 of the Eastern League Northern Division Championship Series, and Hughes, just 20 years old at the time, was given the ball and trusted to face a Portland Sea Dogs lineup that featured such future big leaguers as Jacoby Ellsbury and Brandon Moss. 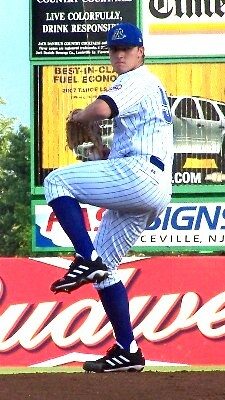 All he did that night was strike out 13 batters in six innings, allowing just one run on a walk and five hits. However, the Thunder’s offense — which featured Brett Gardner, Randy Ruiz, Shelley Duncan, Justin Christian, Omir Santos and…oh yeah, Hideki Matsui — only produced one run through the first six innings, and Hughes didn’t factor in the decision. Fast forward four years — and two more brilliant postseason starts for Triple-A Scranton in 2008 — and Hughes was again given the ball and trusted to pitch a possible series-clinching game of the ALDS; Game 3 against the Minnesota Twins. All he did last night? How about spin seven shutout innings, allowing just one walk and four hits while striking out six. In fact, the only damage he took last night was in the clubhouse, where he was the most frequent “victim” of champagne showers, the last of which came from, of course, A.J. Burnett. Safe to say those minor league playoff experiences don’t really compare to this, right Phil? “No, it really doesn’t,” said Hughes through a laugh. Hughes’ teammates were genuinely happy for him, as many offered their congratulations in the somewhat subdued post-game celebration in the clubhouse. Among them was CC Sabathia. While Hughes has plenty of big league postseason experience under his belt, this was his first October start at the big league level. Sabathia’s Game 1 effort was his 11th playoff start in the big leagues, but he says he didn’t need to give Hughes any advice before the game. “If you know him, you know he doesn’t need any advice on what to expect, he’s pretty good out there,” Sabathia told me. Francisco Cervelli, in a Thunder uniform as recently as last year, was blown away by the California native’s outing. “Wow, he looked like he was a veteran out there,” he said. According to Yankees outfielder Curtis Granderson, Hughes’ early dominance — he didn’t allow a baserunner until the fourth inning — got him more into the game. “You realize that you’re probably going to get a chance to bat sooner rather than later,” he told me. Phil Hughes came to the Trenton Thunder in 2006 as a 19-year-old kid with all the potential in the world. Four years and seven innings of ALDS shutout baseball later, and it’s pretty clear that potential has finally been realized and then some. Yankees pitching coach Dave Eiland knows this all too well. He was trusted with Hughes in Double-A as the Thunder’s pitching coach in 2006, and has played a huge role in the development of New York’s future ace. According to Eiland, Hughes’ maturity has played a big role in his progression from top pitching prospect to trusted postseason starter. “I’ve watched him grow up. I’ve had him since he was 19 years old in Double-A, and I’ve seen him mature. He came in with some raw talent, but he’s always been mature beyond his years,” Eiland told me. Stuff-wise, Eiland says that the biggest key to Hughes development since they were both at Waterfront Park is command of all his pitches. Yes, Eiland mentioned the much-discussed changeup, but it’s another pitch that may be getting underlooked. “When he first started throwing his curveball, it was 68-69 miles per hour. Now, it’s anywhere from 74 to 78,” Eiland said. 7:45 PM — Regardless of what happens, Phil Hughes is my story tonight. Four years ago, you may remember he struck out 13 Portland Sea Dogs in the 2006 Eastern League Playoffs. Fast forward to 2010, and here is getting the ball in Game 3 of the ALDS. How he pitches…well, that’s where the meat of the story comes in. I’m sure you’re all just as curious as I am to see how it unfolds. In any event, the Yankees have provided a transcript of Joe Girardi’s comments in the interview room…I arrived a little too late to make it for that. I will try to be there for Ron Gardenhire’s comments. The Yankees have also been gracious enough to provide me with post-game clubhouse access, so I will gladly pass along player comments when I can. Nobody — the beat guys, me, nobody — gets pre-game clubhouse access. Before I get to Girardi’s comments, let me pass along these notes from Chad Jennings on tonight’s starter, Phil Hughes, and his changeup. I’ve got to say I’d be in favor of expanding the ALDS to seven games. In theory, you might have to start the regular season a day or two earlier so as not to prolong things any longer than need be, but seven games provides a more fair competition between two teams than five does if you ask me. What do you think? I am very, very fortunate to be able to cover the Major League Baseball playoffs this season. And when I do get to a game — the first game I’ll be covering is Game 3 of the ALDS — I’ll have seven familiar faces in Yankee pinstripes. SP Phil Hughes, RP Joba Chamberlain, RP David Robertson, C Francisco Cervelli, INF Robinson Cano, INF Ramiro Pena and OF Brett Gardner have all come through Trenton on their way to their run at a second straight World Series title. Additionally, SP Andy Pettitte, INF Lance Berkman and INF Derek Jeter have all appeared at Waterfront Park on rehab assignments. Of all the non-rehabbers, it may be Hughes who could play the most key role in this series. Yes, Cano has had an MVP-type season and will be relied upon to drive the Yankees offense, but it will be Hughes who will take the ball for what very well could be a pivotal third game of the ALDS. CC Sabathia and Pettitte will face a tough task in Francisco Liriano and another Thunder alum, Carl Pavano. I wouldn’t at all be surprised to see the series tied at one going into Saturday, and it would be the former top prospect’s time to shine. I’d make a prediction, but…well, those don’t seem to go too well for everyone involved. In any event, stay tuned to the blog, as I’ll have some tidbits throughout the postseason. And don’t miss my playoff coverage in the Democrat.